AMA Houston: I'm not only a member, I'm also a fighter. Really people? 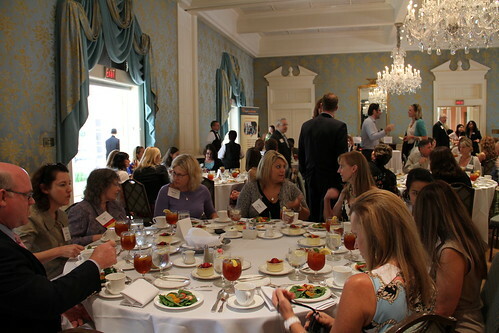 I finally decide that I need to get away from the desk and get myself to an AMA Houston luncheon. And here's the photo that represents the event? Actually, I find it humorous the lady and I look like we're either 1) Italian hand talkers or 2) about to get in a cat fight. Neither are true, but good catch from the photographer! Much better pics of Scott Berg's "Digital EcoSystem" presentation here. In addition to this blog entry being an excuse to post this awesome fight scene, I wanted to give my two cents on an AMA membership. Do it. There were two people at my table looking for full time work. Two ladies looking to expand their sales in the event business. One vendor who reunited with a client he thought he lost. And one seasoned pro who could give her tips on her company's digital eco-system and how they developed material related to the speaking topic. I'm sure each table had their own conversations and reasons for being there. I was there to solely for the speaking content. 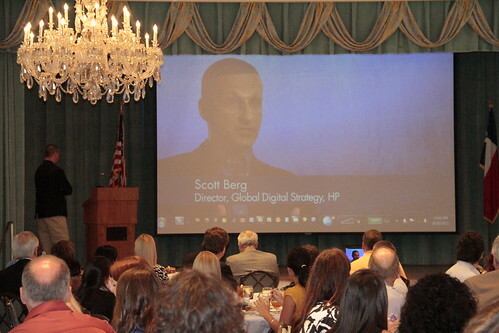 (Any time you have a chance to meet Scott Berg, marketing genius with HP...do it) I came to get another view into the marketing case studies of HP (because they are awesome - check out the Let's Do Amazing video ads - LOVE them almost as much as Allstate's Mayhem). But I left with much more. Maybe some new resumes to share with my employer, new views on microsites from an Oil & Gas pro, and well... a fantastic photo and reason for posting a blog. Newer PostJobs Update. Steve Jobs that is. Older PostCross Pollination for the Greater Good.